Swimming pools aren’t just about swimming. They’re also about getting together with friends, relaxing in the summer sun, and just hanging out. One thing all of these activities have in common is that they go better with a soundtrack. Music is the perfect finishing touch for almost any pool area. Installing an outdoor stereo system can be a smart move for pool owners who throw a lot of parties, or just like to while away the hours by the water. However, buying a stereo for your pool patio isn’t quite the same as buying one for your living room. If you’re thinking about getting an outdoor stereo, here are a few questions to ponder. Does an outdoor stereo system even make sense for you? Notice that we said music was perfect for almost any pool area? There are a few scenarios where it might not make sense. One is if you have cranky neighbors close by and won’t be able to play your music loud enough and often enough to get your money’s worth. Another is if you have a waterfall or other noisy water feature that makes listening to music difficult. Of course, there’s also the issue of your budget. 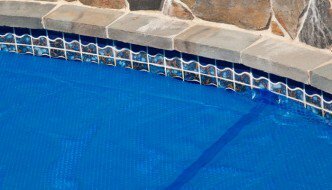 With all the other expenses that go into building a pool, you may want to forgo a top-notch stereo system for a year or two. A boombox or other portable option could serve just fine until then. Should you get a standalone system? Ideally, your poolside speakers should connect to a home theater system inside your house, allowing the receiver to stay protected from the elements. Depending on the system, you might be able to control it from outside via an app on your tablet or smartphone. There are also control systems you can mount on the wall outside. Unfortunately, this setup can be costly and difficult to install. You have to run wires through a wall in your house, then underground to the speaker locations. This can be a lot of work, especially if your pool isn’t close to the house. Many pool owners opt for a less conventional (some might say funky) outdoor setup. If you go this route, make sure your receiver stays dry and has adequate power supply. But above all, don’t spend a lot of money on a system that could get wrecked when the first big storm comes along. When it comes to appearance, there are lots of different options. The simplest is to conceal the speakers with plants or other landscaping (without blocking sound, of course). If you want to be extra sneaky, you can even buy outdoor speakers that look like rocks. As usual, generalizing about prices is futile. The cost of an outdoor stereo system varies tremendously depending on the setup and equipment. Needless to say, you’ll pay a lot more if you have the system professionally installed. Still, hiring a contractor is often worth the money for complicated setups. On the other hand, for someone who’s experienced with home improvement or willing to learn, outdoor speaker installation is a good candidate for a do-it-yourself project. If you’re serious about buying an outdoor stereo system, you’ll need to get a lot more technical than the info in this article. To delve deeper into the product and installation options, check out the outdoor speaker buying guides from Crutchfield and Digital Trends.